Health Insurance Call Centers | 8x8, Inc.
Health insurance call centers rely on different communication tools to address inbound calls. CCaaS, UCaaS, and VoIP are all essential to providing the highest levels of customer service. This article will examine the benefits and advantages of these different tools. Why Are Health Insurance Call Centers So Important? Health insurance call centers are the primary way most insurance companies interact with clients. Many call centers are open around the clock to provide assistance. That assistance might include collecting premium payments, providing guidance about choosing a plan, and explaining complicated plan benefits. Call centers are staffed by well-trainedrepresentatives who may have to support customers in distress. Health insurance products can be complicated and call centers help consumers make the most informed choices about their healthcare. There are numerous communication platforms available to build a high-performing call center. 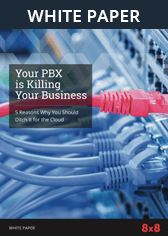 While traditional landlines have been the most common communications platform in the past, new cloud-based solutions offer significant advantages. Call centers need solutions that are reliable, cost effective, and customized to their specific needs. Some of the best tools include "CCaaS" (Contact Center as a Service), "UCaaS" (Unified Communications as a Service), and "VoIP" (Voice over Internet Protocol). CCaaS - A CCaaS solution is a cloud based customer experience platform provided by a third party. Health insurance providers can use a contact center provider's software rather than develop that infrastructure internally. All of the functionality needs in a call center — like interactive voice response (IVR) and automatic call distribution (ACD) — are all operated in the cloud by a single vendor. These solutions provide a better customer experience by seamlessly blending phone, email, and text communication channels. CCaaS also can significantly reduce call center costs by eliminating infrastructure investment and the need to upgrade. UCaaS - This solution provides a unified, secure, and flexible enterprise communication platform. UCaaS platforms can be easily scaled to accommodate seasonal employees or other changes in a company's labor force. Like CCaaS, UCaaS also lowers enterprise costs by moving communication infrastructure offsite. UCaaS platforms allow for enterprise-wide messaging, video conferencing, and other collaboration tools. In addition, UCaaS provide a consistent experience for any employees using the platform. Whether they are in office, out of office, or in the field, all employees have access to the same communications infrastructure. Cloud-based systems like UCaaS are also valuable because of their resilience. Since they are located in the cloud, they have built-in business continuity tools that can be valuable in the event of a natural disaster or other disruptions. VoIP - Voice over Internet Protocol is a combined hardware/software solution that allows users to make telephone calls via the internet. VoIP uses internet packets to transmit voice data rather than rely on a traditional PSTN (Public Switched Telephone Network). One advantage of this platform is that companies are charged for monthly internet access rather than a per-call surcharge. That cost structure offers significant savings over traditional phone systems, especially when making international calls. VoIP also offers the opportunity to rapidly scale communications infrastructure. One drawback of VoIP is that users need reliable internet connections with high bandwidth. However, any disruptions to VoIP are likely to be resolved faster than disruptions to traditional PSTN's. How Do These Tools Support The Mission? CCaaS, UCaaS, and VoIP replace many traditional communication platforms. CCaaS allow health insurance companies to completely outsource their call center functions to the cloud, eliminating manpower and infrastructure costs. UCaaS cloud systems centralize enterprise communications and provide a consistence experience across devices. VoIP allows health insurance companies to abandon unreliable and outdated PSTN's. These communication services are cost effective and can quickly replace legacy systems. Customers need to know that when they pick up the phone there will be someone there to answer their most pressing healthcare questions. These tools ensure you will always be there to answer the call. Health insurance call centers need robust and dependable cloud communications to provide the highest quality service. The right vendor will offer a full suite of communication functions with excellent support and flexible pricing plans.